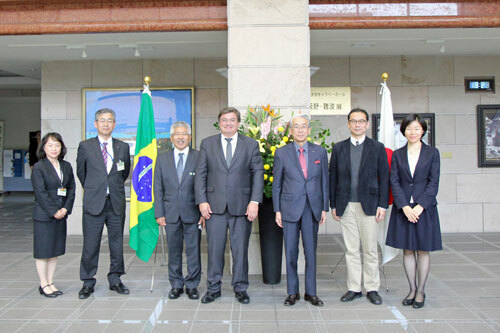 On November 16th 2018, a delegation from Brazil, led by Marilia’s Mayor Daniel Alonso and President Keniti Mizuno from Cultural and Sport Association for Nikkei in Marilia, visited the Higashi-Hiroshima Campus and had a meeting with Executive and Vice President Toshiyuki Sato and Vice President Yasushi Maruyama. With a sister city relationship to Higashihiroshima City (since 1980), Marilia is a Brazilian city located in the state of Sao Paulo that has a good reputation for high quality agricultural products such as coffee beans and oranges. During the meeting, Hiroshima University (HU) and the City of Marilia, respectively gave a brief introduction of themselves. Then, they exchanged opinions about exchange between HU and universities in Marilia. After that, guided by Associate Professor Norio Shimizu, they visited the Hiroshima University Museum where they were explained about the exhibition of fossils and fish. With this visit as momentum, we hope that exchange between HU and Marilia will be further promoted.